The site Pottermore.com launched Thursday with a single teaser page featuring two owls and the words, "Coming soon ... ."
(CNN) -- Harry Potter fans, already an excitable bunch, are in a tizzy over a mysterious new website from series creator J.K. Rowling that hints at future Harry Potter-related content. 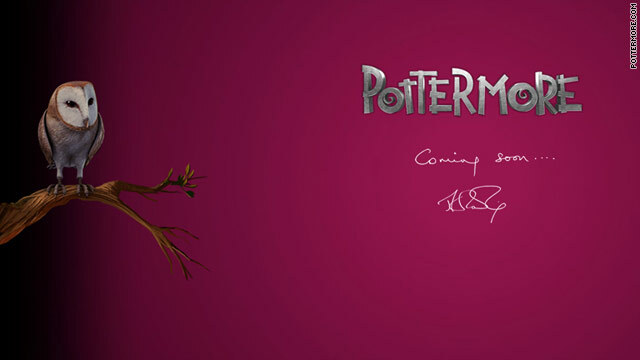 The site, Pottermore.com, launched Thursday with a single teaser page depicting two owls against a dark pink background and the words "Coming soon ..." above Rowling's signature. Clicking either owl takes visitors to Rowling's YouTube channel, where a video screen counts down the days, hours, minutes and seconds until a Rowling "announcement" -- set for 7 a.m. ET Wednesday. There's also a new Pottermore Twitter account, which as of Friday morning had posted only two tweets: one linking to the YouTube page and another mentioning a Google Maps-powered puzzle game that revealed the letters "POTTERMORE." Blogs and Twitter are full of fans hyperventilating about what it all means. "!!!!!!!!!!!!!!!!!!!!!!!!!!!!!!!!! This Is like the most exciting thing that's happened in a realy long time!!!!!!!!!!!!!!!!!!!!!! I've been freaking out and running around the house screaming :)" posted one user on MuggleNet, a Harry Potter fan site. Guesses range from an online game to a digital comic book to a virtual Harry Potter encyclopedia to a new promotional effort for the final movie in the franchise, "Harry Potter and the Deathly Hallows: Part 2," which hits theaters July 15. What it probably doesn't mean, however, is a new Harry Potter book. A representative for Rowling told UK newspaper The Guardian on Thursday, "All we can say is that Pottermore is the name of J.K. Rowling's new project. It will be announced soon, and it is not a new book." Andrew Sims of MuggleNet wrote on Thursday: "I saw a preview of Pottermore recently and can tell you that it is fantastic. I'd say more but I had to make an unbreakable vow concerning its secrecy." What do you think "Pottermore" will be? What do you want it to be? Let us know in the comments below.